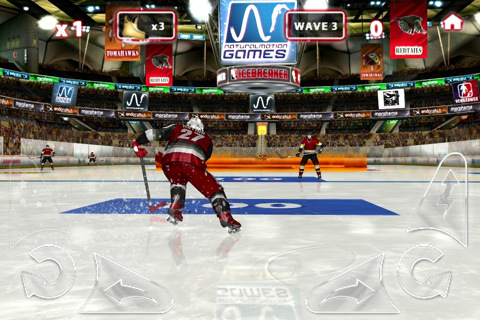 NaturalMotion Games’ Icebreaker Hockey [99¢] is a bit difficult to describe. Not because it’s a complicated game, it’s not — but it so resembles the studio’s Backbreaker series of games it’s a bit hard to really dig into the premise of it without noting its pedigree. So, if you’ve played Backbreaker, you’re going to know what to expect from Icebreaker, but if you’ve avoided the series because you’re not a fan of football, you’ll be in for a treat. Icebreaker takes the same, challenge oriented, tower-defense-in-reverse aspects of Backbreaker and puts it on the ice. The basic premise of the game puts you in control of a single skater, puck on stick, trying to make a goal. In your way are a set number of defenders and a goalie that will attempt to stop you. You can think of it as a game dedicated solely to the breakaway. While that sounds simple enough, the game does a good job of ramping up the difficulty slowly as you complete each of the ten challenge modes. Ten might not sound like much, but considering there are also three different difficulty settings, you’ll end up with a lot of bang for you buck. There’s also an endurance mode that tasks you to survive an endless number of waves — for the obsessive types it provides an increasing challenge as you move through the various waves. Each challenge will also net you a star rating, which is used to unlock achievements and is factored from you overall score, which you can compare on the leaderboards through Game Center. Control wise, if you played Backbreaker, you’re going to instantly recognize the setup for Icebreaker. 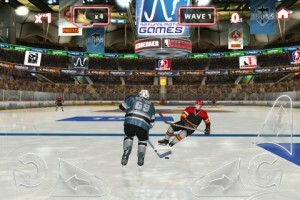 Tilting your device moves your skater left and right, and a series of buttons lets you dash, deke and spin. While it’s one part reverse-tower-defense, the other part is all high-score game. You rack up points as you’re skating along for deking out of the way of an incoming attacker, hitting score zones and for holding slap shots for ridiculous amounts of time. If you’re the type of person who likes to rub it into a digital goalies face, you can also showboat to increase your score. All of these factors combined make getting a high-score on a level a balance between the two different modes. If you take too long to unleash a slap shot, a goalie will pop you in the face or if you spend too much time rolling into the high score patches, the defensemen will eventually catch up and take you out. While you want to get the highest score along the way, you main mission is to put the puck in the back of the net and if you fail you’ll have to start the wave over again. Thankfully, aiming the shot is handled automatically and as long as you get the shot off, it’ll usually get past the goalie. There are no licensed teams here, but if you’ve been itching for an arcade-style hockey game for iOS, this will fit the bill perfectly. You do get to customize your player with one of several different team types, skin color, number and name, but for the most part you’re controlling an empty avatar whose only goal is to put the puck in the net. Hockey fans haven’t had much to choose from on the App Store, so if you’ve been longing to lace up your skates, this will certainly give you something to do. It’s not the console-perfect simulation NHL 2K11 promised to be, but it controls and plays a heck of a lot more smoothly. It’s a casual, easy to pick up and play hockey game that has a surprising amount of depth and skill hidden inside of it for those willing to give it the time.